My Granddaddy and I when I visited him. He followed my Grandma and died just a few months later. January 21st, 2017 we marched in NYC standing up for women’s rights, equality for all and unconditional love. A few days later my grandma Leona died - a powerhouse of a woman who left us all out of breath the last time we visited as she sped around their housing complex at 90 years old talking about all the ways she was involved in their community. 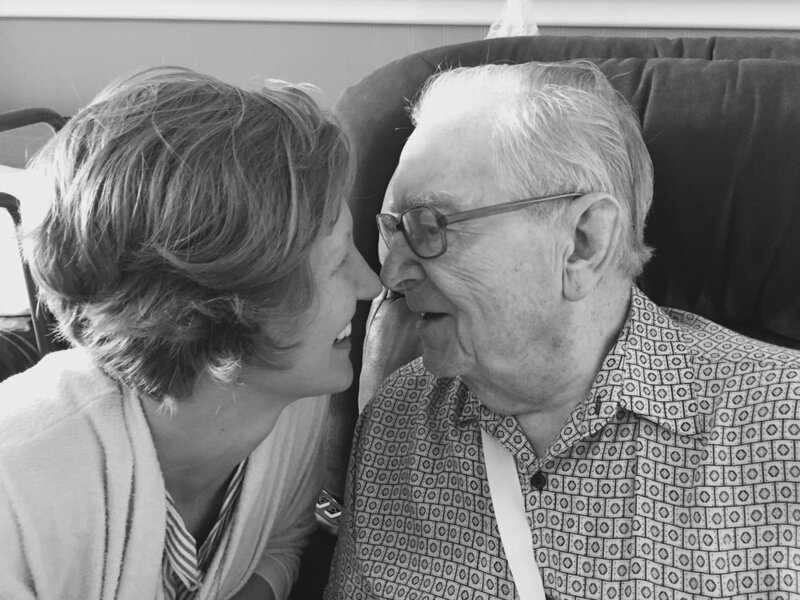 Shortly thereafter I visited my granddaddy and was touched by the power of love, of simple connection, of a smile or an outstretched hand. Everything we desire in this world - love, abundance, support, healing, success - is on the other side of fear and resistance. Whether you're feeling guilt or fear of failure, regret or fear of success, less than capable or just plain scared, what you desire isn't far away, you've just built a wall blocking yourself from it. When my grandma died I felt so many sensations of fear and resistance. Yet I could feel her with me in the following days, spreading love, peace, joy and forgiveness. She had already forgiven me for not visiting in the months prior and was calling me to be my best self in the world. I felt like she was inviting me to see miracles - birds flying in groups everywhere I went after she died; to give miracles - a visit to my grandfather to fill him up with love; and to receive miracles - support from my boyfriend, family, friends and even the stranger who offered her seat on the plane. Because if you desire more love, joy, opportunity and/or abundance, then it starts with understanding that the path to love is about giving and receiving. The path to love starts with self-forgiveness and a willingness to open your heart to the love that is always around you and, most importantly, already within you. And knowing that the more you receive, the more you have to give. Today’s activity is perfect for paving a path to more love, joy and abundance in every form. It helps remind us that no matter what we’ve done, it’s enough, and whatever we have to give or have within ourselves, is also enough. As I mention in the video, it’s a multi-part activity so feel free to do it all or pick and choose the parts that speak most to you. Using essential oils is optional, but recommended for a full mind body experience. Contact me if you are new to essential oils or have questions - the quality of your oils matters! Do the breathing with mantras for 3-10 minutes and the movement for about 1 minute or until you feel a shift in energy. If you’re looking to rewire your ability to receive abundance in your life, I recommend doing it daily for at least 30 days. AND the Integrated Movement at the end is a lovely practice to do with a partner, with your children or in front of a mirror to help all parties give and receive unconditional love. Let me know what you're calling in through this practice in the comments below! If you didn't receive this in your email inbox, click here to sign up for tools, tips, updates and a free meditation.